Roseroot, also known as golden root or rholdiola rosea, has been used for centuries as a natural adaptogenic herbal remedy for the treatment of depression and fatigue. For quite some time, we’ve been familiar with the therapeutic effects of roseroot for the treatment of depression. Only until recently has the scientific community begun to back up the effectiveness of roseroot thanks to a growing body of evidence. As you may have figured out, I love exposing effective natural remedies to the public. And that is just what I am doing with this post. Now that the evidence is strong, there is even more of a reason to consider roseroot for treating your depression. Roseroot is beginning to have a strong presence in the world of alternative medicine. 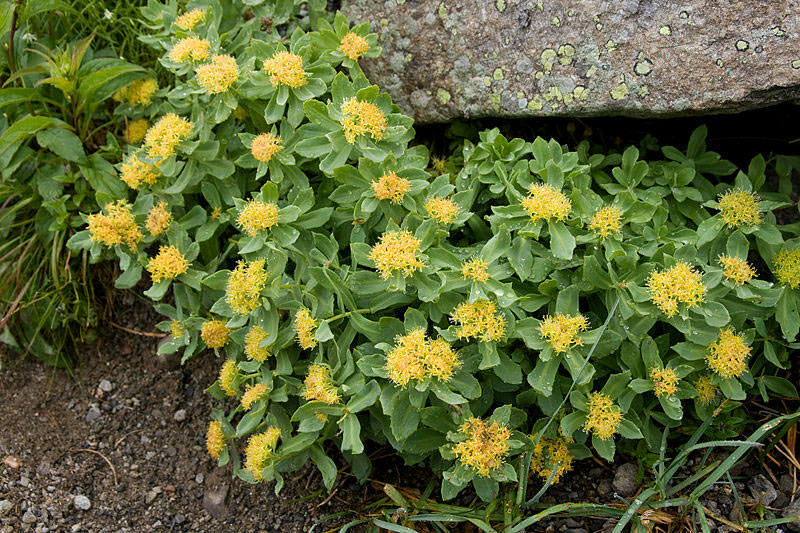 Multiple studies have shown that rhodiola rosea is not only effective for mild-moderate depression, but also prevents fatigue, stress, and increases sexual energy. On the contrary to antidepressants, the side effects are quite mild. The most common side effects were noted to include dry mouth and dizziness. A recent study has yet again shown the power of roseroot. The study found that roseroot was equally as effective as an antidepressant called sertraline. But the good news doesn’t end there! The participants reported much less side effects with roseroot compared to those who were taking sertraline. Specifically, 30% of those who were taking roseroot reported undesirable side effects while 63% of people who took sertraline reported adverse side effects. Ok so the evidence out there shows that roseroot is an effective treatment for mild-moderate depression and some of its symptoms according. If roseroot has been found to be equally as effective as an antidepressant, why not try the natural approach first and then step up to pharmaceutical drugs if you have no success? Pharmaceutical drugs certainly still have a place in medicine. As a level-headed promoter of natural medicine, I do not aim to discredit them. I just think pharmaceutical drugs should only be used as a last resort because they typically have more negative side effects. It is best to explore the natural alternative options first. In this case, roseroot is a great option to try before getting into habit-forming antidepressants. Considering Roseroot for Your Depression? Let me tell you something about myself. When I was in my late teens and early 20s, I was plagued with random bouts of depression. To make it even worse, it runs in my family. It was a horrible experience. I have always preferred the natural approach, so I did some research. I was determined to find a natural cure and break free of my family’s anxeity & depressive trends. This is when I first found roseroot. If your depression is causing you to become jaded, fatigued, and/or sluggish (much like I was), then roseroot is a perfect natural remedy for you. Within weeks of consistently taking roseroot and making sure I got some physical exercise, my depression was completely gone. I was then convinced (but the science did not back it up as much as it does now). I would like to add that If you experience high-strung anxiety with your depression, consider holy basil instead. I have seen people with depression & anxiety see relief with this herb as well. If you are reading this article to find relief from depression, you are not alone. Many more people experience depression than you may think. Know that depression is curable without any antidepressants (although some resort to them and that is ok) if you take the proper steps. If you want more information about naturally treating depression, feel free to sign up for my health coaching services–depression is one of my many specialties and I would love to help you become yourself again. Feel free to comment below with any thoughts, comments or question. You can also check out our healthy living Q&A forum and post questions there…it is open to the public for a limited time. Be well & be happy. Information on this website is for educational purposes only. Please read the disclaimer before before using any information on this website.